Yesterday, we looked at the indispensable need for unity by defining unity – “the state of being one or united.” Unity points to harmony. We noted three biblical examples of unity that surface in the New Testament. Today, notice the defining marks of unity. Specifically, unity is a gift from God. Pay close attention to how the New International Version translates Psalm 133:1-3. 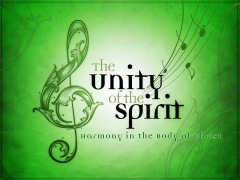 James Boice observes, “The threefold repetition “running down,” “running down,” and “down” – the Hebrew uses the same verb each time – emphasizes that the blessing of Aaron’s anointing was from above himself, that is, from God.” So we surmise that unity is a precious gift from God. This gift must be cherished and cultivated. This gift must be guarded. But even children recognize an important principle, namely, good gifts should be shared with others. This leads us the second mark of unity. When Aaron received a blessing from God, his task was to share the gift. Boice adds, “There is even the hint, that since the oil was ‘precious oil’ – the best oil blended with myrrh, cinnamon, cane, and cassia (Exod. 30:22-24) – the anointing would have been wonderfully fragrant and would have filled the air wherever Aaron went.” Christians would do well to follow Aaron’s lead and share the blessing of unity with other people. Paul speaks of the “fragrance of the knowledge of Christ” and the “aroma of Christ” in 2 Cor. 2:14-15. Perhaps the good gift of unity that comes from God can be manifest in this culture for his glory. Perhaps the world will smell the aroma of unity when they interact with believers. And the unity that the world “smells” will be a powerful witness and confirmation of the truthfulness of the gospel. Here is a challenge. We are either uniters or dividers. The book of Nehemiah illustrates this principle in a powerful way as the people of God stand united around God’s Word. First, the people begin by asking Ezra to bring the book – they are united around their desire to sit under the teaching ministry of God’s Word (Nehemiah. 8:1). Second, the people were attentive to God’s Word – they are unified around their desire to listen and pay attention to God’s Word. Nehemiah 8:3 says, “And he read from it facing the square before the Water Gate from early morning until midday, in the presence of the men and the women and those who could understand. And the ears of all the people were attentive to the Book of the Law.” These godly people spent a good portion of their day listening to God’s Word and learning about God’s Word. Yet we find ourselves in a culture that can scarcely sit through a 20-minute sermon. People are begging pastors to shorten their sermons. And many pastors are listening! Some have dropped the Word of God altogether and replaced it with self-help tips, psychology, and man-centered techniques. May it never be! The people of God should stand unified in their ardent desire to listen and pay attention to the Word of God! “And all the people went their way to eat and drink and to send portions and to make great rejoicing because they had understood the words that were declared to them.” (Nehemiah 8:12, ESV). These people applied what they were learning and responded with great reverence. Finally, the people responded in worship to God’s Word – they were unified in their adoration and worship. Several observations seem to be in order. Note that no one is complaining about the length of the service. No one is questioning the length of the sermon. A few years ago, a good friend took me to lunch. He leaned in close and said, “Last Sunday, you looked at your watch while you were preaching. I don’t ever want to see you look at your watch in the pulpit. God has given you a message. You need to deliver it! Quit worrying about the time. Let the roast burn!” In Nehemiah 8, the people of God are fixated on one thing, namely, submission to God and bowing before his transcendent majesty! In heaven, all the saints will be in perfect harmony. They will be united. Boice rightly says, “[Unity] can be rediscovered and reestablished in the church, but only as men and women get outside themselves and submit their own selfish individualism to a higher and more worthy cause than self-indulgence.” As we learn to set aside our selfish agendas, unity will begin to grow and offer a foretaste of heaven. May the marks of unity define our lives. May we acknowledge that it is a gift from God. May we share it with others. And may the world see the church function in the way that God intends. Then and only then, will they know that we are Christians by our love because they will see God’s people united around the plans and purposes of God!